Tom Kalil of the White House OSTP hosts screening of Minority Report in Washington. A still from the movie Minority Report. © 2002 Twentieth Century Fox Film Corp. All rights reserved. The movie Minority Report was supposed to take place in 2054, but it seems that we’re reaching the future ahead of schedule. In the 10 years since the sci-fi film was released, several of the “futuristic” technologies have come to fruition or seem within reach, like 3-D holograms, predictive policing, bug-like robots, and a gestural computer interface system that’s like an iPad in open air. These advances have made the film’s discussion of free will, government regulation and use of technology, and other issues more relevant than ever. That’s why Slate, the New America Foundation, and Arizona State University will host a Future Tense screening of Minority Report at Washington, D.C.’s Landmark E Street Theater at 555 11th Street NW, on Monday, Aug. 6, at 6:30 p.m.
We won’t just watch the movie. 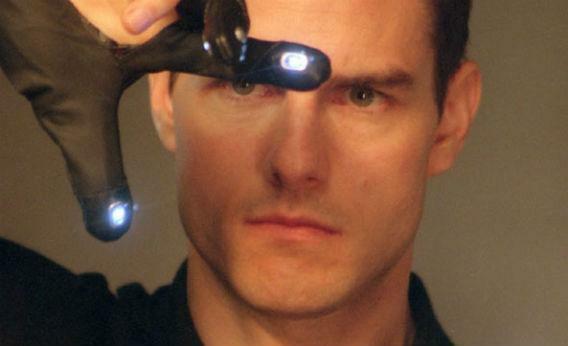 Our host Tom Kalil of the White House Office of Science and Technology Policy will introduce the film, and when it’s over, he’ll share a few thoughts on how we can embrace cutting-edge technology without falling prey to Minority Report’s darker visions. If you would like to join us, RSVP to Futuretensedc@gmail.com with your name, email address, and any affiliation you’d like to share. You may RSVP for yourself and up to one guest. Seating is limited, so if you want to see Minority Report on the big screen again—or for the first time—email now. This is the first of a new series of Future Tense events called “My Favorite Movie.” Each “My Favorite Movie” screening will feature a leading voice from science and technology—researchers, policymakers, journalists, or other cutting-edge thinkers—sharing a beloved film that can help guide the way we think about the future. Keep watching the Future Tense blog or Twitter feed to learn about more “My Favorite Movie” screening events.